Over the weekend, there was no shortage of caffeine-fueled spectators at the 2015 US Coffee Championships; an annual event held by the Specialty Coffee Association of America and the Barista Guild of America. 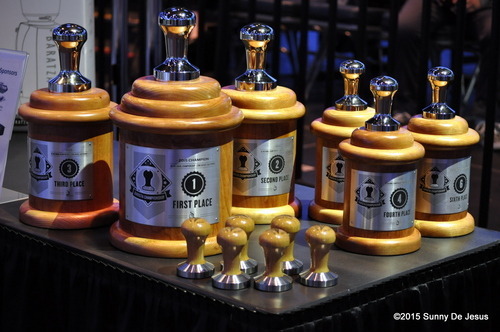 Sort of like the Olympics of the Coffee Industry, the US Coffee Championships brings together Coffee Experts from around the nation who compete to be titled as the best in their field. From the looks of the List of winners from Sunday’s finale, Southern California contestants took 1st Place in 3 out of 5 categories Yay, SoCal! 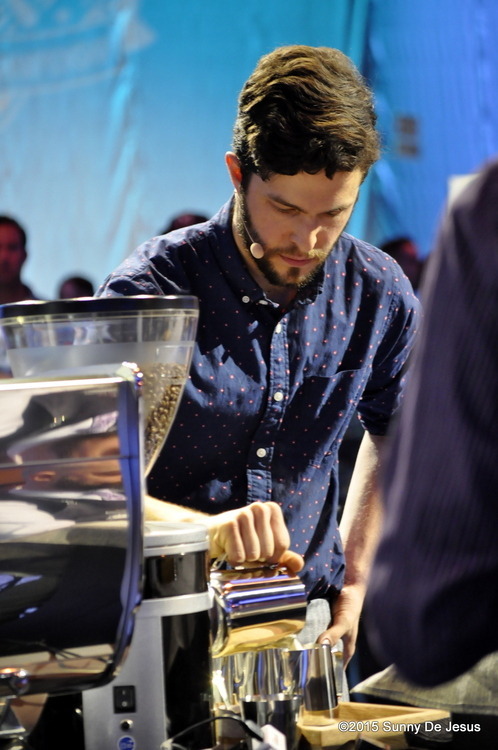 1st Place U.S. Baristas Cup Champion – Charles Babinski of Go Get Em Tiger Coffee and G&B Coffee, Los Angeles, California. 1st Place U.S. 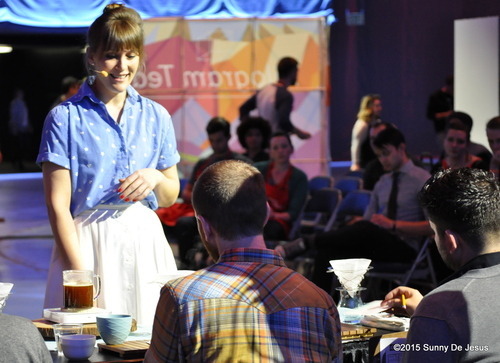 Brewers Cup Champion – Sarah Anderson of Intelligentsia Coffee, (Los Angeles) Pasadena, California. 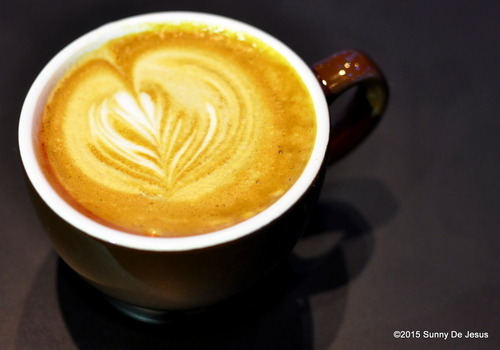 1st Place U.S. Latte Art Cup Champion – Angie Chun of Coffee Code, Buena Park/Garden Grove, CA. On Saturday, I arrived just in time to watch a good portion of the Baristas Cup semi-finals. It was quite interesting to watch the play-by-play of what was involved in being a competitor. To compete in the Baristas Cup, there is a total of 15 minutes to present three drinks (an espresso, a cappuccino, and a signature drink) to seven judges from start to finish. For instance, being a great storyteller of each drink that you’re presenting matters to the four Sensory judges who look for the sensory feel of the overall coffee experience. This part of the competition is to show how Baristas are in charge of creating, presenting, and leaving the impression of the overall coffee experience to their customers. Each competitor had a different story to tell in addition to showcasing their knowledge and technique in brewing coffees. The signature drink highlights their uniqueness in the category. Charles Babinski of Go Get Em Tiger Coffee and G&B Coffee in Los Angeles, California had prior competition experience at the US Coffee Competitions, but he was never the top prize winner until he won over the weekend. From a far, his semi-final presentation was a lasting one as he spoke of his passion of first being introduced to coffee in college working as a Barista and in becoming an owner of two coffee bars in Los Angeles. 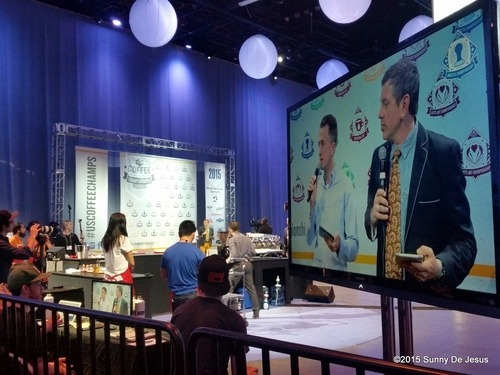 In my opinion, of all the contestants in the semi-finals of the Baristas Cup, Babinski’s overall presentation evoked the strongest emotional connection as he was very much engaged with the judges and coincidentally, was the “talk” of the audience who saw his performance. Sarah Anderson of Intelligentsia Coffee competed in the Brewers Cup category which involves presenting a single whole bean coffee chosen by the US Coffee Championship organization and her choice of brewing style. She started her competition nervously, but quickly got her footing when she spoke of her choosing the right brewing method to present the coffee after pursuing to understand the coffee from its origins. Throughout the competition, various coffee roasters rotated to serve coffee to the attendees. Among the dozen of coffees that I tasted throughout the event, I enjoyed this Latte by Temple Coffee Roasters from Sacramento, California.